How to Raise Your CPAP Score | Advanced Sleep Medicine Services, Inc.
Gone are the days of wondering why you did or didn’t get a restful night’s sleep! 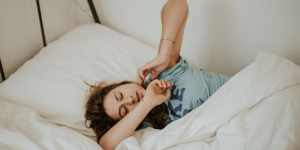 With brand new technology emerging to monitor sleep, people are taking their sleep into their own hands with wearable and non-wearable sleep trackers. Some of the most advanced ones are programmed into CPAP machines that connect to your smartphone. They can track your usage, events per hour and even air leakage! This can also be very valuable in evaluating your data and improvements over the course of time with your doctor. If you’re looking to be an all-star or MVS (Most Valuable Sleeper), here are 7 pointers to add to your game plan. Whether you’re using an automatic cleaning method or a good ole sponge, having a squeaky clean machine will not only help keep you from getting sick but also make sure your machine is functioning how it should. Get in the habit of cleaning this on a daily basis to hit your target of getting quality sleep. When you turn on your machine, it will start tracking your score. So if you head to bed with thoughts and to do lists still streaming in your mind, you simply aren’t going to sleep and miss the goal entirely. Try winding down and relaxing before entering the sleeping court. This pointer is more for the rookies. CPAP therapy can be a tricky adjustment for many people. If you have issues adjusting to the device, practice wearing it throughout the day. What you score on game day (night) can say a lot about how much you practiced! Simply put, showing up is half of the battle. It is important to keep your eye on the goal of a high score by wearing your device every time you sleep. If you are sporadic on usage, your overall quality of sleep and CPAP score will decline. A player is only as good their fans. Having a support system around you will help keep you accountable to sticking with therapy and encourage your performance. Whether its your spouse, an online forum or a mentor, get a cheerleader! Like the professional athletes, create a bedtime routine that will make you a winner in the sleeping game. Maybe it’s taking a hot bath, turning off all electronic devices or reading a book. Relaxation is different for everybody, so find something that works best for you. Most importantly, maintain a positive attitude! If you begin feeding into negative thoughts about your therapy, it can cause unnecessary dread and anxiety leading to poor performance or fumbles. Adding these pointers to your game plan can help you get a hole in one every night, or in this case, your personal best score. If you don’t have a CPAP machine that gives you your score at the end of each night, consider upgrading to the AirSense 10 AutoSet!